Son of George Warburton, a cotton waste dealer in Kestor Street and nephew of Thomas Warburton, founder of Warburton's Bakers. On leaving school aged 15 it was his father's intention that he become an auctioneer but owing to the death of his uncle, the head of the grocers/bakers business in Prospect Street, he followed his father who had to take over. 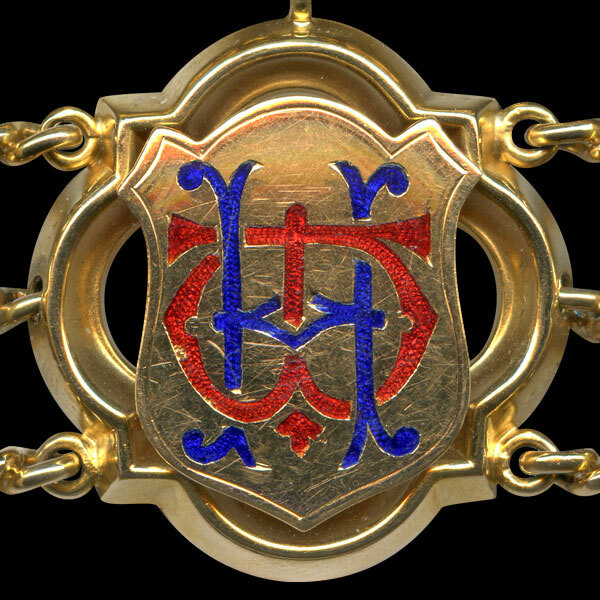 Eventually Henry took over the company which had developed into Warburton's Bakery in Back o'th Bank and was largely responsible for its expansion into a major company. Chairman of Cleansing and Sewerage Committee 1921, 1927-36. 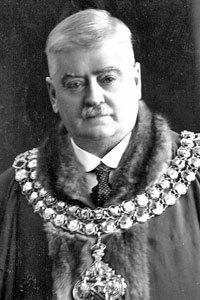 Alderman 1923. By time of his death he had become Father of the Council, having served for 36 years. Member of North West Liberal Association from 1900. President of Bolton Master Bakers Association for 30 years. He was also President of Lancashire Federation of Master Bakers in 1929 with a seat of the National Council. In this capacity he visited Greece and West Indies giving help in various industries there. Director of Bolton Wanderers FC, becoming Chairman in 1930. First President of Bolton Cricket League 1930 and Trustee of Astley Bridge Cricket Club. He sponsored the Warburton Cup for Bolton Cricket League. Member of Park Hill Bowling Club and life member of Old Links Golf Club. Freemason - he was a member of St George's Lodge 1723, Past Master of the Georgian Lodge 4595 and Member of the Arch of St John 21. Methodist - he worshiped at Higher Bridge Street where he was Treasurer and Circuit Steward. His wife, Rachel, was Mayoress. Henry Warburton's interest in football was well known but it was not quite such common knowledge that the his wife shared his interest with the same enthusiasm. She watched many games and when she talked about football she knew what she was talking about. It is said that on one occasion she was at Burnden Park while the team were training, and was talking with Trainer Eccles. Mrs Warburton said, "I can't understand players missing penalties - it should be easy to score." Eccles suggested that she didn't quite appreciate the difficulties, to which she replied, "Well, I think I could get three out of six myself." "Have a try", said Eccles. Mrs Warburton went to the penalty spot and Eccles went into goal. Mrs Warburton put the ball through three times in five attempts. 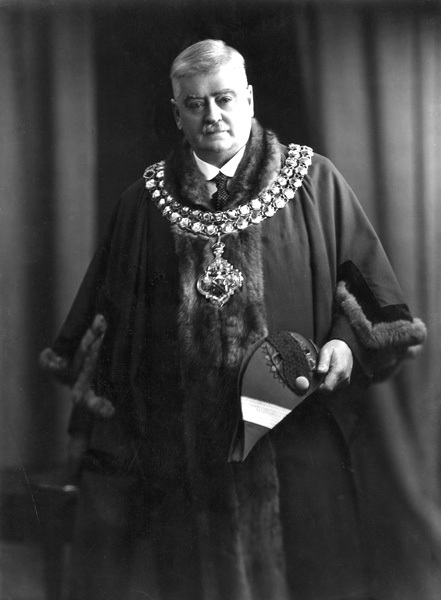 Formal portrait of Henry Warburton as Mayor of Bolton. Henry Warburton's link on the Mayor of Bolton's Chain of Office.